The Kiwis were dismissed for 312 on day four in Dubai, having been bowled out for 90 in their first innings. Pakistan level the series at 1-1 with one match to play. The third Test starts on Monday in Abu Dhabi, where New Zealand won a thrilling first Test by four runs. 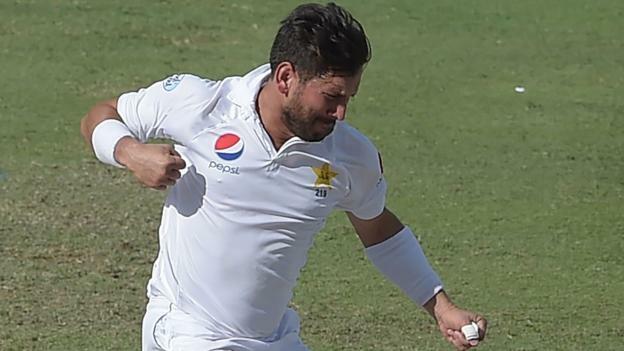 Yasir took 10 wickets on day three, a Test-best 8-41 as New Zealand collapsed from 50-0 to 90 all out in reply to Pakistan’s 418-5 followed by him claiming the first two wickets when the Kiwis followed on. The tourists resumed on 131-2 on day four, but lost opener Tom Latham for 50 and Ross Taylor for 82 before Yasir snared BJ Watling lbw for 27 to leave the Kiwis 255-5. Despite 77 from Henry Nicholls, New Zealand lost their last five wickets for 57 runs, Yasir removing Ish Sodhi and Neil Wagner before having last man Trent Boult caught behind to complete victory and end with 6-143 in the second innings. Yasir’s previous best match figures were 10-141 in victory over England at Lord’s in 2016.